Looking for fitness heart rate monitors but not too sure which ones are the better ones? If so, you have come to right page. On this page you will find some recommended heart rate monitors for users who are training to be fit or to lose weight primarily in a gym environment. These days there are so many models, from so many brands, that we are spoilt for choice. You want to choose one that meets your own specific needs and is of a sufficiently high quality. We have done our research and come up with a list of good to excellent heart rate monitors based on a number of factors, the most important being favourable user reviews. These monitors are therefore all tried and tested. Some of the higher end monitors on this page are also suitable for running training. We will divide our recommendations into 3 groups based on features: basic, intermediate and advanced. So let us start with the basic ones. First let us take a look at Omron. The Omron HR-100C has been one of the best selling basic heart rate monitors for years. It shows no sign of losing its popularity. Reasons? It is cheap to buy, simple to use and has the basic features to satisfy most beginning heart rate monitor users. The Omron shows you the current heart rate, and allows you to set heart rate training limits with alerts. It also comes with a mounting bracket so you can attach the wrist watch to a bike's handlebar when you are cycling. Here is a user review from someone who has just started an exercise program. It summarises nicely what the Omron is and does. Next we look at the Timex T5G941 Easy Trainer. It is a simple heart rate monitor that just shows your real time heart rate during exercise. After your exercise, you can check your exercise duration, average and maximum heart rates to see how hard you have worked out. That's it. No frills but very simple to operate. The chest belt works with most gym equipment. One owner finds interesting uses for his Easy Trainer to measure the effects of other activities on his heart beat. Now it is the turn to look at Polar. The Polar FT2 is relatively new. You can set your heart rate training zone manually or have it automatically set based on your age. It has only one button: so it is extremely easy to operate. When you are done training, you can review your training duration, average and maximum heart rates. Its chest strap uses coded transmission to avoid interference and cross-talk. One cool thing: the HeartTouch feature. You can cycle through the information displayed (heart rate/duration/time) by simply bringing the watch close to the chest belt. No button presses required! Another model to consider is the Timex T5G971 Personal Trainer. Its display is large and clear. 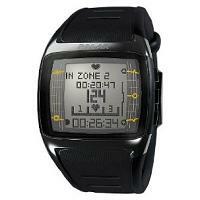 It has the features of the Timex Easy Trainer such as average and maximum heart rates, plus a few more. It counts calories. You can also manually set a heart rate zone, and view the time spent in the zone after your workout. Best of all, at the end of your activity, you can measure your heart rate recovery i.e. the change in your heart rate after one minute. You can use it to measure your improvement in fitness over a period of time. The fitter you are, the greater your heart rate falls after one minute i.e. the faster you get back to your normal heart rate level after the exercise. Finally we have the Polar FT4. It has more features than the other basic heart rate monitors mentioned here. You can set your heart rate training zone manually or have it set automatically. The visual display lets you switch between different statistics while you are training: heart rate, calories burnt, workout duration and current time. At the end of your workout, you can review your average and maximum heart rates, total calories burnt, and time spent in target zone. If you are into logging your data, here is some good news. It saves data from your past 10 workouts, giving you the opportunity not only to review how you performed today, but also to see how you performed during some earlier sessions. It is a proper watch too, with an alarm and two time zones. The FT4 offers a choice of two colors: silver or brown. First let us look at Sigma Sport from Germany. The Sigma Sport PC 15 is a well designed heart rate monitor, with a modern look and a clear and large display. It has got features like manual and automatic heart rate training zones, a calorie counter and a lap counter (up to 50 laps). You can review a lot of data both during and after training including: time in zones, exercise duration, average/maximum heart rates and calorie burnt. Users are generally impressed with the large and clear data display. That is important because, while you are vigorously exercising you simply don't want to spend too long glancing at the watch face just to read the data you want. For cyclists, the PC 15 also comes with a bike mounting bracket. And if required, the chest strap can interface with most cardio equipment. All in all it is a great package with a good feature/price ratio. Next, the Timex Ironman Zone Trainer. It offers manual and automatic heart rate training zones, a calorie counter and a lap counter (up to 27 laps). It has two timers: a simple countdown timer and a recovery timer (1 or 2 minutes). Plenty of data can be reviewed post-training: time in target zone, average/max/min heart rates, calorie burnt and lap/split times etc. For users who have had problems with cross talk and interference, we have some good news here. The Zone trainer uses digital transmission which minimizes those issues. The Zone Trainer comes in different shapes and sizes: T5J031, T5H881, T5H911, T5J983. Given that it is a digital heart rate monitor, the Timex Zone Trainer is keenly priced, even more so when there are often large discounts available. Polar RS100 is a solid heart rate monitor for running and general exercise. Let us have a quick run through its main features. You can set up your heart rate training limits manually or automatically via OwnZone. OwnZone is a cool feature because it sets the heart rate limits taking into account your current state of fitness. This helps to make sure that you train within safe limits. It counts calories, and even more, it works out the percentage of the calorie burnt as a result of burning fat. It has a lap counter (up to 99 laps) and two alternating timers for interval training. After training, data that can be reviewed include: average/maximum heart rates, time in/above/below target zone, calorie (and fat %) and detailed lap summary. The RS100 accumulates calories from multiple sessions. Now you can keep track of how many calories you have burnt in say, a week as a result of doing exercises. This is a great feature if you have a certain short term calorie goal to fulfill. Now we come to the Polar FT7. It has one interesting feature: it automatically calculates and divides your heart rate training zone into TWO zones: fat burning zone and fitness improving zone. Contrast this with most HRMs that automatically calculate just ONE heart rate zone for you. When you are training, you can choose to lock into one particular zone, and the watch will beep when you train too hard or too light. This ensures that you train with the desired effect. Note however that it is not possible to set a manual heart rate training zone. While training, with the push of a button, you can switch data on the display: heart rate, calories, exercise duration/current time. Once the training is done, you can review: duration, average/maximum heart rates, calorie burnt and time spent in the two zones. The Polar FT7 saves data for up to 99 training sessions. It also provides some useful weekly/cumulative statistics such as weekly calorie burnt etc. Reviewing past training efforts can be quite motivational. 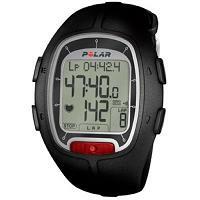 The Polar FT7 is currently one of the best selling HRMs on Amazon. The Polar FT40 is very similar to the Polar FT7. In fact the FT40 adds just two main additional features to the FT7 model, the rest being pretty much the same between the two HRMs. Everything that is said about the FT7 applies to the FT40 (except that the FT40 saves up to 50 sessions' data). 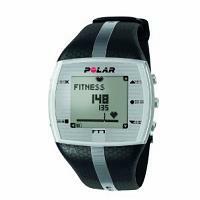 First, the Polar FT40 calculates the fat percentage of calorie burnt and not just calorie burnt. Next, and more importantly, the Polar FT40 offers a Fitness Test to track your long term fitness. This is a simple test and takes a few minutes to perform. At the end of the test, you get a number called OwnIndex. This number is comparable to VO2 Max, and it is an indicator of your aerobic fitness. You can take this test periodically to measure how much your fitness has improved. It is really nice to have a quantitative measure, a concrete number, to see your fitness improvements. Lastly we come to the Timex Ironman Race Trainer. It is a great training tool for running and cycling. You can manually set up a heart rate training zone or train in one of the 5 preset heart rate training zones (based on age). It has large, easy-to-read screens that are simple to navigate. It offers a 5 segment interval timer (repeatable) and a lap counter (up to 50 laps). It also features a countdown timer (3 options) and a recovery heart rate timer (selectable between 30 secs, 1, 2, 5, 10 minutes). A lot of different data can be reviewed: time in target zone, average/max/min heart rates, calorie burnt, lap times/heart rates, interval times/heart rates, recovery heart rate. Up to 10 sessions' training data can be saved. It uses digital transmission to avoid interference and cross talk. Timex Ironman Race Trainer comes in several shapes and sizes: T5K217, T5K216, T5K218, T5K219 . The Polar FT60 stands out among other advanced heart rate monitors. It is able to offer training advice to you if you want it. Based on your goal and Fitness Test result, it helps you plan your workouts by suggesting weekly exercise time (in various heart rate zones) and calorie targets. At the end of the week, it gives you training feedback, and plans a new set of targets for your workouts for the following week. This Star Training Program fulfills some functions of a real coach. You can also use the FT60 to track your weight graphically. The FT60 provides the OwnZone automatic heart rate training zone (based on your state of fitness). In addition it also lets you set manual heart rate training limits, which is a feature mysteriously dropped in FT7 and FT40. 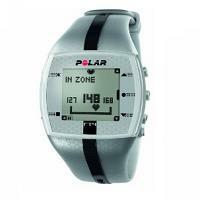 So for those users who want to have FULL control over their heart rate training zone, the Polar FT60 is the one. Once the workout is over, you can review training effect feedback, time in various HR zones, average/maximum heart rates, calorie burnt (with fat %). It also stores training data for up to 100 workout sessions, so you can review them later. For users interested in speed and distance measurements when running, the FT60 can be paired with an optional Foot Pod (or GPS Sensor) too. Here is a user review that gives the reasons why he has chosen the Polar FT60 instead of Polar F55 and FT80. Note that we do not include the Polar FT80 in this recommendation, even though it is based on the FT60. The reason is that the FT80 seems to have a lot more issues with users, in particular regarding its display which for many is difficult to read. That is it, folks. Hope that we have shown you which fitness heart rate monitors are worth your consideration. For more suggestions on intermediate and advanced heart rate monitors, particular those with specific features for running, please see the running heart rate monitor page.